My twenty-third stadium of 2013 was on Tuesday 22nd October 2013 at Millfield in Hadleigh, Suffolk. 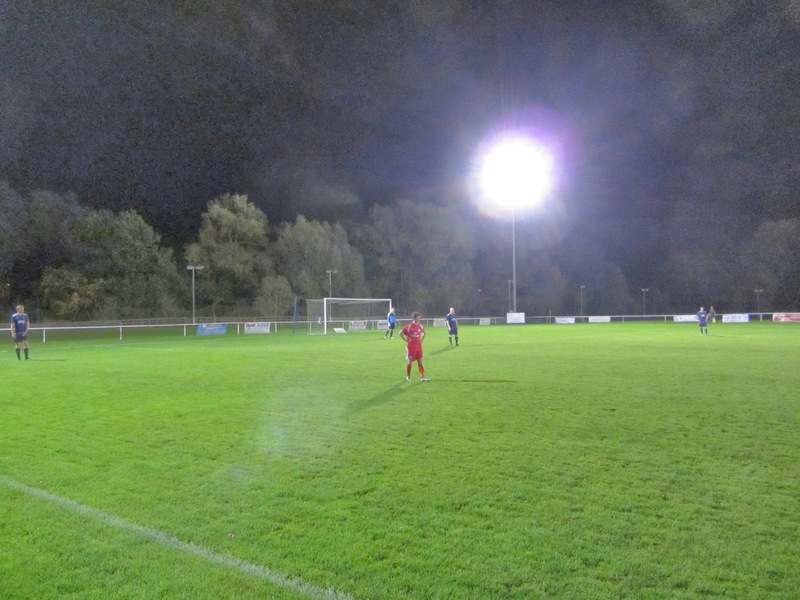 The match was Hadleigh United vs. FC Clacton in the Eastern Counties League Premier Division. Millfield is part of a sports complex on the outskirts of Hadleigh to the south-west of the town centre. The venue is 10 miles from the nearest railway station at Ipswich and has been home to the club since 1954. There is one all-seater stand on the southern side of the ground - this is a covered stand with the seating made up of three rows of wooden benching. Directly behind this stand is a training pitch. The areas behind the goals is uncovered standing - there is plenty of space behind the goal at the eastern end of the ground although the western end backs onto another section of the sports complex so space in this area is fairly limited. The northern section of the ground contains a covered standing section for about one-third of the length of the pitch. This side of the ground features a very impressive clubhouse which has been recently renovated as part of ground improvement works. The tone for the night was set straight from the kick-off as Hadleigh opened the scoring after just 20 seconds. Matt Downing skipped past a challenge before thundering a shot into the corner of the net from 20 yards. The home side's lead should really have been doubled in the 12th minute when the ball broke to Josh Mayhew inside the box - with just the keeper to beat Mayhew crashed his shot off the crossbar and the ball bounced to safety. Clacton were not offering much of a threat so it was a case of seeing when the next Hadleigh goal would come. This happened in the 34th minute when Mayhew managed to get his name on the scoresheet after heading in Matt Downing's corner. The visitors started the second half brightly and could have reduced the deficit when Jake Clowsley's well struck shot was saved by Fred Howe. Hadleigh got back on top of the play around the hour mark and after a few shots at the Clacton goal notched up the third goal in the 69th minute. The ball was pulled back Scott Chaplin close to goal and he struck low past Joe Fowler to make it 3-0. From this point the home side seemed content with a three-goal victory so just kept possession and didn't allow Clacton to threaten their goal. The final whistle went with Hadleigh recording a comfortable win.